1. The JVC 9800 Digital Video Camera (supports capture rates of 60, 120 and 240 frames per second). 2. 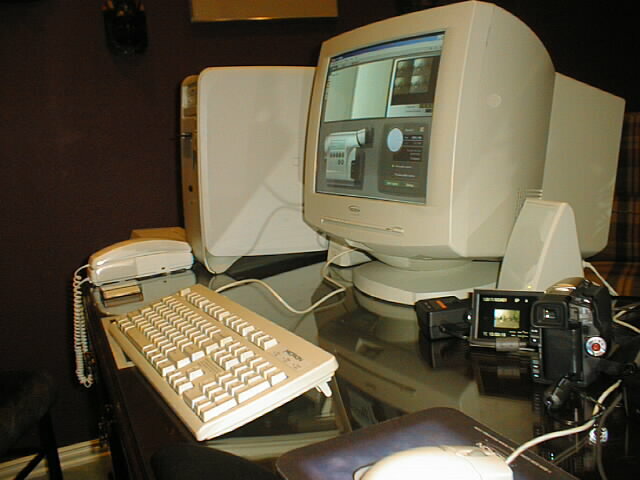 An IEEE 1394 (Firewire or I-link) compliant capture card. Ariel Dynamics recommends the Studio DV by Pinnacle. There are number of digital capture cards available. We at ADI Inc. prefer the Studio DV by Pinnacle. The only problem with this card is that it use a sophisticated proprietary software. The Studio DV software only work with their own card. The cost of this system which include the card and the software is around $125. The Ulead software is very good and allow the use of almost any digital capture card including the Studio DV. There is an extensive tutorial that come with this package. However, it is tune for making movies rather then just capturing for Biomechanical use. But it is an adequate method to learn the system very well. Another software that distributed with number of cards in the market is the Eulid software which accompany many of the commercial available cards. You will need the Adobe Acrobat to read this PDF file, You can download the Acrobat Reader here. Both of those tutorials are including subjects which are not relevant to capturing video only. They are also including the subjects of making home movies. However, extensive knowledge is learned using these tutorials. Please note that so far you are not using any of the APAS system. The APAS capture system which we developed over the last 30 years and started from only recording coordinates from 16 mm film to capturing analog video. At the present there is no reason to re invent the wheel. The capturing cards that available on the market coming with their own capture software and they are very sophisticated and adequate. We at ADI Inc. only had to develop the interface software to theirs in order to extract the high speed video fields and to be able to trim more accurately the video sequences. In the next page you will learn the setups necessary to make it happen.